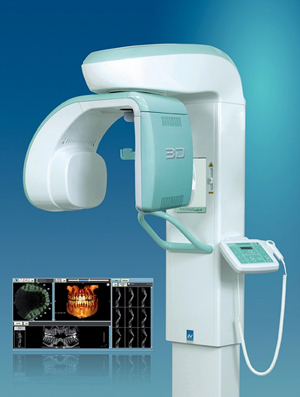 TBased on the mechanical platform of its 2D counterpart is the Rotograph EVO 3D 3-in-1 system: Panoramic, Cephalometric and 3D CBCT. At the top of its product family, the EVO-3D employs the latest “cone beam” technology with a Flat Panel Detector (FPD) based on Amorphous Silicon with Cesium Iodide scintillator. By acting on the computer interface the operator can seamlessly switch between regular 2D Pan / Ceph functions and 3D volumes with a standard Field of View (FOV) of 8.5 X 8.5 cm. Compared to the EVO D 2D system, ease of use with the EVO 3D is virtually unchanged with virtual keyboard representation on your capture computer lending itself to operators of all technical expertise. 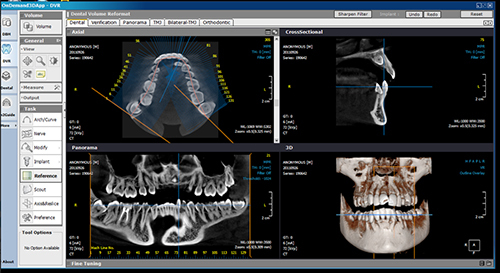 Scan time for 3D examination is limited to around 11 seconds, allowing you to access the entire dentition particularly fast while reducing patient dosage and risk of movement during examination. • + ALL tests available on Villa EVO D 2D System!